I love Age Defying Thinning Hair Treatment Conditioner by Andalou Naturals. It adds a lot of benefits to my hair. Age Defying Thinning Hair Treatment Conditioner by Andalou Naturals works great on my aging head of hair and my hair stays cleaner longer! I have used Age Defying Thinning Hair Treatment Conditioner by Andalou Naturals along with the corresponding shampoo. Both products make my hair look great! Age Defying Thinning Hair Treatment Conditioner 11.5 fl. Oz from Andalou Naturals prepares hair and scalp by reducing breakage and increasing strength. 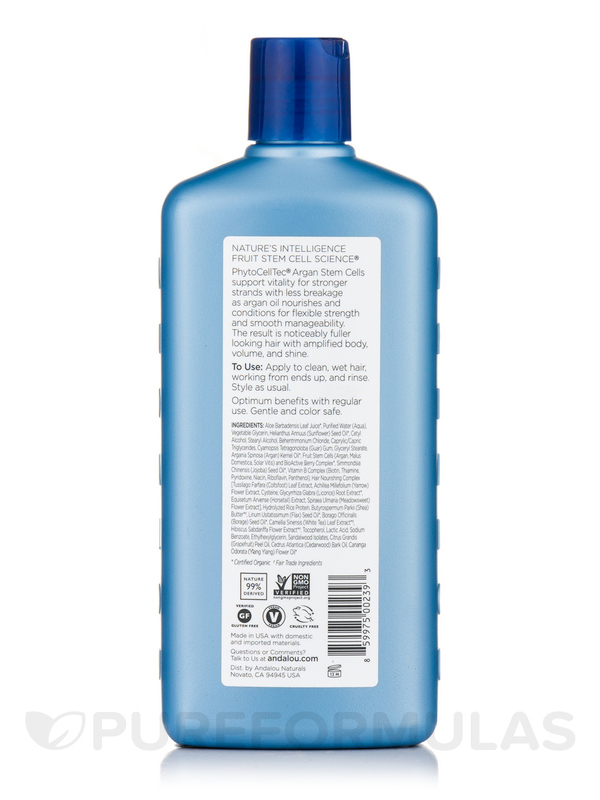 This conditioner contains natural extracts that fortifies hair against split ends. The active ingredients present in this Andalou Naturals conditioner strengthens each strands‚ reduces breakage and stimulates better hair growth. This conditioner also increases hair texture and body and nourishes the hair for a healthy shine. This conditioner contains sunflower oil that is a natural emollient to soften hair. Aloe barbadensis juice in this conditioner may work to prevent dryness of hair and provide better moisturizing benefits. The goodness of jojoba oil is well known. It works as an antimicrobial and also has the ability to move towards hair shafts and strengthen hair from within. Grapeseed oil generally adds moisture to dull hair while alleviating dry scalp. 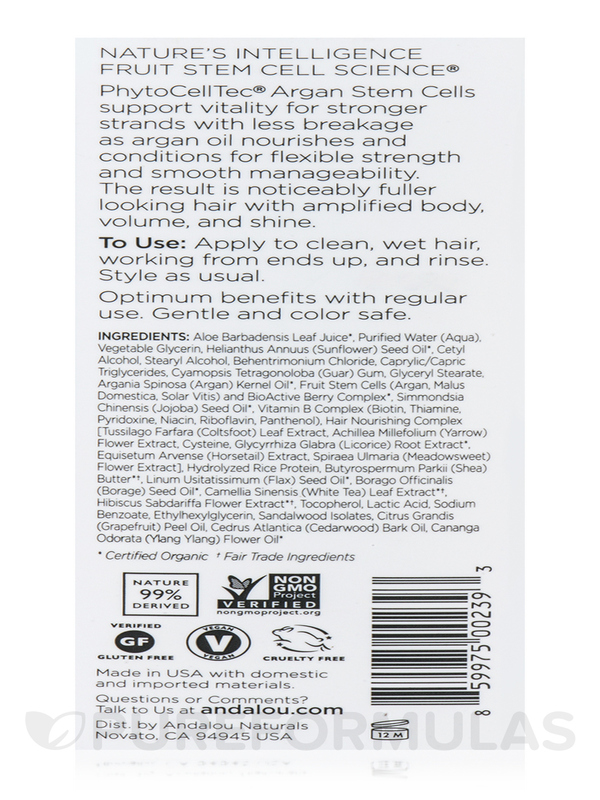 This Andalou Naturals conditioner also contains Argan oil that is good for deep conditioning. Experts believe that along with conditioning‚ Argan oil may exfoliate the scalp and prevent clogging of pores. Yarrow oil may help in scalp regeneration and in the promotion of healthy hair. With so much goodness packed into Age Defying Thinning Hair Treatment Conditioner 11.5 fl. Oz from Andalou Naturals‚ your hair is sure to thank you! Apply to clean‚ wet hair‚ working from ends up‚ and rinse. I'm over 60 and have tried other brands designed for aging, thinking hair. As with all Andalou products I am very pleased with the results after using Age Defying Thinning Hair Treatment Conditioner - 11.5 fl. oz (340 ml). A little drying when used more than weekly. And as I've found with all "thickening" formulas the scent is strong (though less so than other brands) but it the scent doesn't remain after rinsing. I don't use as much since I don't need to wash my hair as often. The Age Defying Thinning Hair Treatment Conditioner makes my hair feel very smooth and shiny! I have used the shampoo as well together for 2-3 years. I am reducing chemicals and I like this natural blend over many other formulas you can buy at the stores. Age Defying Thinning Hair Treatment Conditioner by Andalou Naturals smells chemicals. It has a strong smell and made my hair feel dry. I did help a little with my thinning hair but I'm probably not gonna buy again. Totally "head" over heels for Andalou! Quickly became a true love staple in my shower! Age Defying Thinning Hair Treatment Conditioner by Andalou Naturals Softens without breaking or weighing down. Smells wonderful! Instills healthy essential oils into my scalp and hair, and that alone is worth it! It does not Break or weigh down. I am happy with Age Defying Thinning Hair Treatment Conditioner by Andalou Naturals and recommend it. I have very dry hair so it's hard to leave it greasy, but this Age Defying Thinning Hair Treatment Conditioner by Andalou Naturals just seemed to coat it too much. It doesn't have the most pleasant smell either. Though, I do like that it's pretty pure and natural. 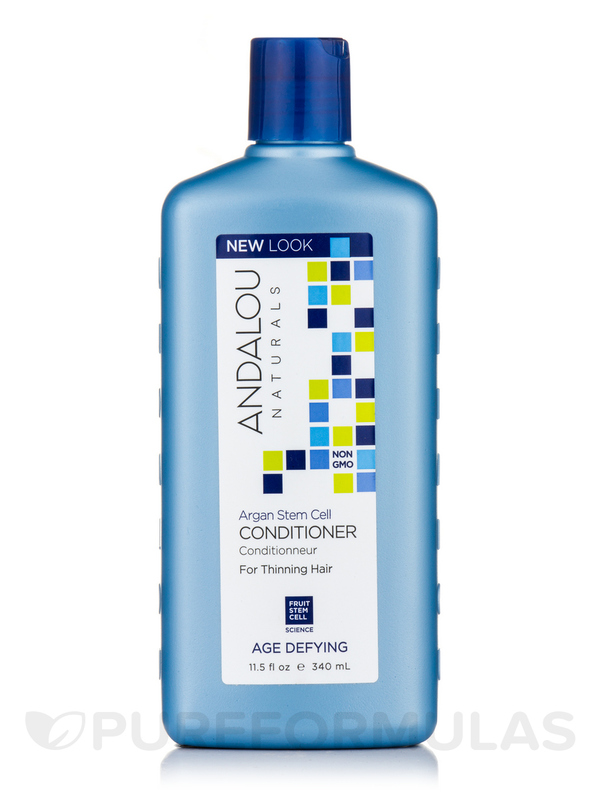 Age Defying Thinning Hair Treatment Conditioner by Andalou Naturals is great! Have only used it as few times and see AND FEEL a major difference, I can't wait to see what even more time will do. I will definitely be ordering again! Hopefully, the shampoo will be in soon so I can order that as well. The way my hair looks and feels thicker.